Pictured are 'Northwich Boys with the Cheshire Yeomanry' at Langley Park. Thomas Brookes Minshall is pictured on the left in the back row. Can anyone identify others in the picture? 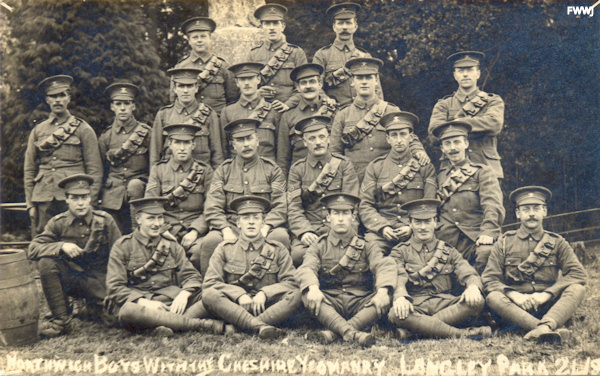 Thomas Minshall enlisted with the Cheshire Yeomanry at Chester, on 27 August 1914. The Cheshire, Denbighshire and Shropshire Yeomanry constituted the Welsh Border Mounted Brigade. On 3 September the Brigade moved to Norwich, and the next morning the Cheshire Yeomanry marched 14 miles to the camp allotted to it at Bungay. For some reason this camp was unsuitable and five days later the Regiment moved to Kirby Cane Hall nearby. Sometime in October there was a further move to Langley Park, Loddon, not far from Norwich.